The intimate friend of Pope and Swift is best know by his charming and instructive Fables. He was born at Barnstaple, in Devonshire, and belonged to the old family of the Le Gays of that county. His father, reduced in means, apprenticed him to a silk mercer in the Strand, London, in whose employment he did not long remain. The first of his poems, Rural Sports, appeared in 1711. In the following year he became secretary to the Duchess of Monmouth, and he served for a short time as secretary to the English embassy in Hanover. His next work was his Shepherd's Week, in Six Pastorals, in which he ridicules the sentimentality of the "pastorals" of his own and preceding age. It contains much naturalness as well as humour, and it was the precursor of Crabbe's rural sketches. In 1726 he published the most successful of his works, the Beggar's Opera - the idea of which had been suggested to him by the Dean of St. Patrick's. It was received with unbounded applause and it originated the (so-called) English opera, which for a time supplanted the Italian. In wit a man, simplicity a child." "All spoke their claim, and hoped the wand. What! no physician speak his right! None here? but fees their toils requite. Who fills with gold their jealous hand. Intemperance is esteemed a friend. And as a courted guest destroys. Who finds employment for you all." Through flow'ry fields he took his way. 'Vengeance aloud for justice cries. At length his forfeit life hath paid. For public good the murd'rer dies. What bloody feasts regale his hours! O impudence of power and might! Had'st pullets yesterday for dinner! 'Shall kites and men alike be treated? 'Whose murders spring from power and pride. "Tis necessary Wolves should eat. Ten thousands are devoured by men! But a pretended friend is worse.' "
Along the winding gloom he roves. Prolong the sweet alternate notes. To shun the hateful sight of man. 'Whence is this dread of every creature? His ear imperfect accents caught. By the thick shade concealed from view. Within the woods enjoy content. Than man, of animals the worst. A vice peculiar to the kind. Is in the cruel shmbles slain. Their stores are sold, their race destroyed. What tribute from the Goose is paid? Does not her wing all science aid? And drudge to raise the merchant's gain? What now rewards this general use? He takes the quills, and eats the goose!' "
From far beheld the horrid sight. 'All cowards should be served like you. Call for revenge. O stupid race! 'We bear no terror in our eyes. It wakes their slumbering sons to war. The Wild Boar and the Ram. For admirable rebukes of human arrogance, see The Elephant and the Bookseller and The Man and the Flea. 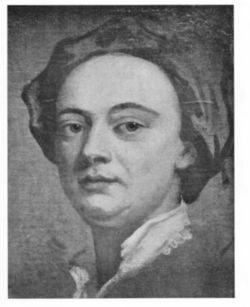 Fables of Mr. John Gay (PDF 27mb) first appeared 1726, this edition London, 1773.